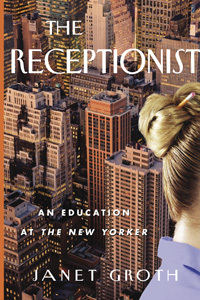 In one of the first acts of kindness I experienced in New York, a near stranger gifted me the book The Receptionist. She said she had tried to read Janet Groth’s memoir of her twenty plus years working as a receptionist for The New Yorker, but that she didn’t recognize many of the writers and figured that outsider feeling made it difficult for her to enjoy reading it. As a writer, she assumed I would appreciate it more. Writer or not, avid reader or not, this book is difficult to appreciate unless you are a diehard fan of The New Yorker. I’ve read a story from it every now and again, but I’ve never subscribed and I certainly couldn’t name its editors throughout the years. Since I don’t often read memoir, I approached this book as a cultural study: this book would show me New York in the second half of the twentieth century, and it would show me the part of it I most wanted to understand: the ever elite literary community. But really, that’s all this book does. Groth rarely dives beneath the surface of her glamorous Manhattan life. There are entire chapters dedicated to restaurants she ate at and the writers she ate with. Because of all the name-dropping in this book, I felt like I had no sense of who the author was because I only ever saw the people she interacted with, not her. Maybe I asked too much of her memoir. It is supposed to be a book about a specific time and place inside The New Yorker office and how the office changed and reacted to important moments in American history (the assassination of JFK, for example). But the marketers of this book really sell it a different, rather misleading way. The back cover copy talks of this being a book about a woman in search of herself and the reviews dotting the book mention “self-discovery” and a “revelatory examination of self.” Maybe I missed these revelations. Starting the book, I was intrigued to find out why an intelligent college graduate and awarded writer would stay a receptionist for nearly a quarter-century. I suspected this book would dive into the social implications of women in the workforce in the fifties, of the glass ceiling, a of how sexism occurs in even the most liberal workplaces. Spoiler alert: Groth spends one chapter—five and a half pages—examining these questions and attempting to answer them–and it’s the very last chapter to boot. As for Groth’s self-discovery, while a few inner monologues occur throughout the book, it is only in one chapter near the end that she reflects on her life, her upbringing, and her family and considers how these play into her personal inability to push for a promotion at the office. Most of the book is invested in talking about the men she dated. There are countless chapters about her boyfriends and lovers, until finally one of the last chapters, titled “Mr. Right at Last,” tells about her husband. I did not pick up a book about New York City, one of the most important American literary magazines, and women’s rights in the workplace to read about boyfriends and husbands. My favorite memoir is still Patti Smith’s Just Kids. It took a time and place very similar to Janet’s story (the music and art scene of New York during the second half of the twentieth century), but infused it with much more life. Yes, there are mentions of important people like Andy Warhol and Lou Reed (and the book is not solely about her but about her relationship with the photographer Robert Mapplethorpe), but the heart of the story is still her story. We see her thoughts and feelings, not simply the things she did and people she met. I was disappointed with The Receptionist because it had so much potential and wasted a lot of time—similar to Groth’s experience at The New Yorker, I suppose.